I’m not sure how to transition to this, so I’m just gonna say it: in Exodus 24, 74 people sit down and literally have dinner with God. But at least they describe what it looked like around Him. “and under His feet there appeared to be a pavement of sapphire, as clear as the sky itself.” (Exodus 24:10) So the ground looked like the sky… so was He just floating? Was the ground just reflecting the sky? Was the ground made of some tangible material sky-stuff? Not sure if it matters. And apparently they all sat down to dinner. Nobody said what was served. Nobody said what they talked about. If you’re a Judeo-Christian mystic, that is the worst sort of tease. But I’m already getting used to those. They had 4,000 years to cover, they didn’t have space to write like Stephen King. 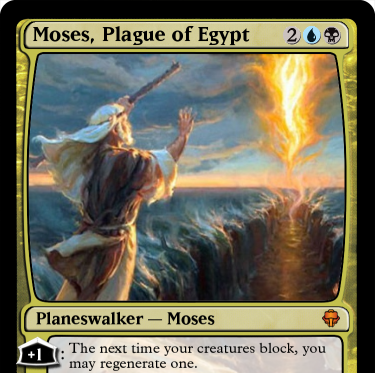 So THEN God gives Moses the Ten Commandments AGAIN. Moses goes the rest of the way up the mountain, into the cloud God covered the top in, because He wanted some privacy even though he just had almost 100 people over for dinner. And it takes a whole 40 days to carve these ten rules down… because God told him a lot of other things too. You’ve heard of the Ark of the Covenant, right? Big gold box, melts peoples’ faces? Well I’m flattered that the Bible made it into Hollywood, but I’m way ahead of y’all at 2 Kings 24 and still haven’t seen that yet. But, sneak preview – when the Ark does get stolen and put in their god’s temple, the statue’s head falls off. Then everybody gets the plague. I’ll mention something about this temple – it’s not just a symbolic building to show God you love Him. The Tabernacle was the literal dwelling-place of God. The Ark of the Covenant was brought to the back of the temple in a secret room. It was so sacred and separate that almost no one could ever go there. The Ark had two massive gold-covered angels sculpted above it. Between their wings, it was said, was where God would sometimes sit. The bad news is, God’s ditching the Israelites. They’d been crammed in together on this road trip and they couldn’t stand each other. He even says so – “because you are a stiff-necked people and I might destroy you on the way.” Brrrrr. Is it cold in here? He even tells them to dress down and take off their “ornaments” out of humility. (i.e. their jewelry, unless this was a tacky Christmas sweater party and they were wearing baubles and Christmas lights. This was the desert and there was no Christmas. You knew I was kidding. I’m just saying in case you skimmed and missed that.) So they do, and the people mourn. This probably involved watching The Note-scroll and sending him drunk tablets at 2 in the morning. The Bible was a good enough friend not to talk about that in detail. And onnn that note, they’re off!